Cairns’ best kite boarding location is Yorkeys Knob, which is 10 minutes north of Cairns city. This is the perfect kite boarding area with a safe, shallow lagoon, perfect for learning and developing your advanced skills and tricks. At Yorkeys Knob, the wind direction is side shore (as opposed to Palm Cove, where it’s onshore). This means Yorkeys Knob is safer for kiters and onlookers, as if the wind picks up, you stay on the water, rather than getting dumped on the beach and ending up in the trees. Not a good look for anyone! 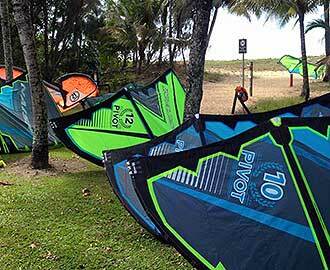 Kite Rite Australia has been kite boarding and providing kite boarding lessons at Yorkeys Knob since 2000. Before that, Kite Rite’s owner / operator Chris Rose, spent years travelling around Australia looking for the perfect place to establish his kite boarding business. So what makes Yorkeys Knob the best place to kite board in Cairns? Yorkeys Knob is the only kite surfing beach in Cairns that gets the right winds and combines it with shallow waters and a wide beach. It has no direct on shore winds. Its wide beach has no coconut or palm trees on it. 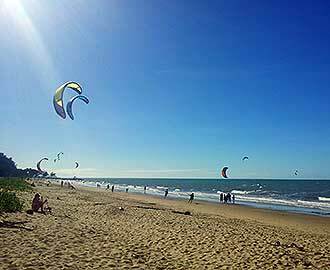 It’s the only beach in the Cairns area that gets the trade winds suitable for kite surfing, from April to October. 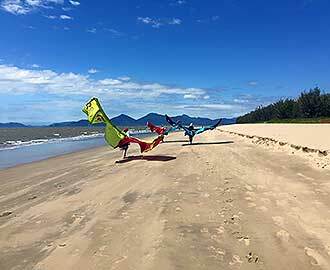 Not only is Yorkeys Knob Cairns’ best kite boarding location, it’s also one of the easiest to access kite surfing destinations in Australia! Big call, but we’ve made it. It’s just 13km from the domestic and international airports, it’s easily accessible by public or private transport, has lots of car parking and a shaded tree area to chill out and refresh away from the wind. Chris from Kite Rite Australia has been doing kite surfing lessons and recreational kite surfing at Yorkeys Knob since 2000. He knows the beach, its best locations and the conditions. He is also the only true local operator, who lives in the region all year round (other operators leave town with the winds). At Yorkeys Knob the weather is perfect for kite boarders of all experience levels. It’s got the right wind speed, wind direction and shallow waters and lagoons. The average wind speed between March and November is usually 15-20 knots. So it’s windy, but not too windy. They are forgiving winds for learners, while still providing great conditions for advanced kiters. Cairns kite boarding holidays make perfect sense. Not only is this destination perfect for kite boarding, it’s also home to the Great Barrier Reef and World Heritage Rainforest. There’s over 600 day tour options available for you to choose from, not to mention accommodation which ranges from budget to beautiful. So if you are planning a Cairns kite boarding holiday, or want to learn kite boarding in Cairns, then contact Kite Rite Australia today and we’ll book you in for lessons, equipment and the low down.